At least 21 people were killed by suspected members of dreaded Boko Haram in Marguba community and other surrounding villages of Beneshiekh, the headquarters of Kaga local government area of Borno state. 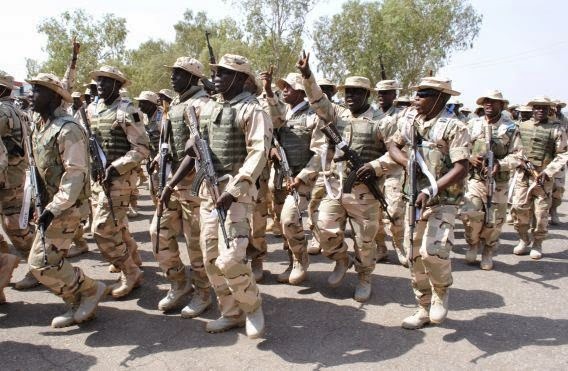 It was gathered that at least three major terrorists camps have been destroyed in the well-cordinated attacks that include the destruction of the notorious Tokumbere camp in the Sambisa Forest.While confirming the operation the Director Defence Information, Major General Chris Olukolade said he could not confirm the identity of the freed victims and their origins and he could not state if any of them was from Chibok until after thorough screening and proper investigations. The Defence Headquarters also confirmed the information on its Twitter feed on Tuesday. "Troops this afternoon rescued 200 girls and 93 women from Sambisa Forest. We cannot confirm if the Chibok girls are in this group," it said, adding that Nigerian troops had also destroyed three camps run by the militants"
This is heartening news for all Nigerians and the army should be commended for its efforts, whether the girls rescued are the Chibok girls or not, 293 Nigerians will soon be reunited to their loved ones and that in itself is awesome.